Voulez-vous pour s'amuser? Oui! Moi! Moi! 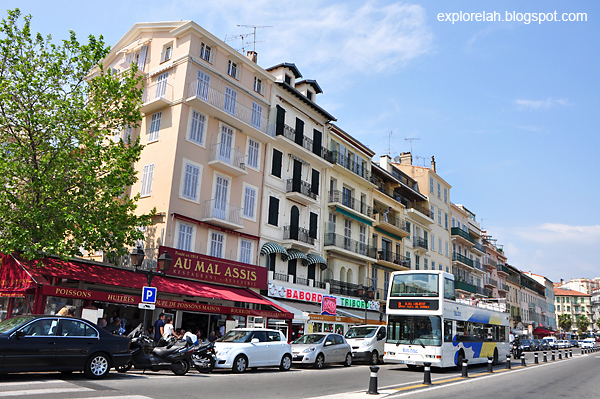 Our first port-of-call onboard Royal Caribbean's Liberty of the Seas Western Mediterranean cruise was Cannes, France. I'm sure most would have heard of Cannes through its internationally renowned and prestigious film festival where the red carpet turns the avenue into a huge stage for the catwalk of celluloid fashionistas. 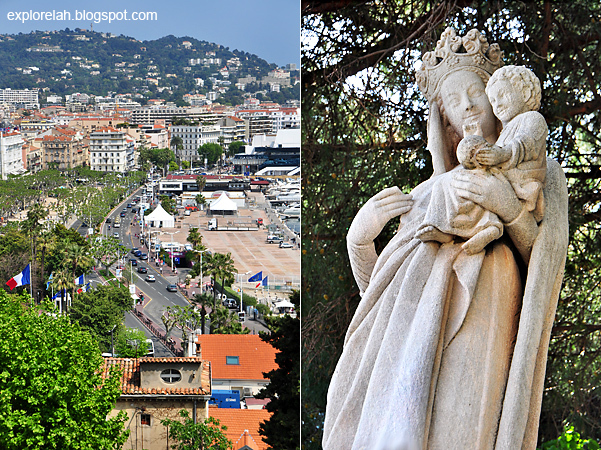 But other than the glitz and glamour that lights up this city every May, what's more to it since the choice of Cannes as the crowning venue for the global film industry was a political residue of the 1930s rather than it being chosen solely because of its foot in the Mediterranean Sea and balmy weather? 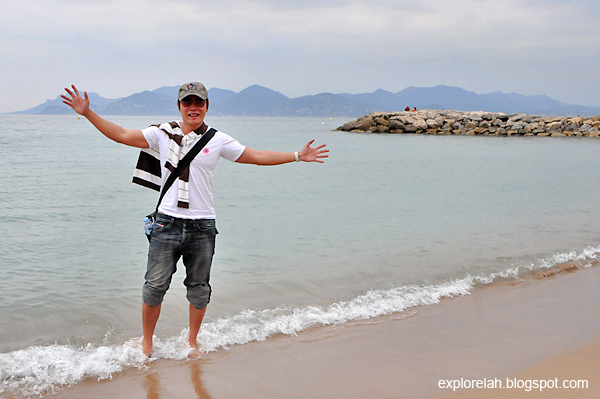 Well, let's find out what's there to see and do at the Cannes coastline of the beautiful French Riveria! 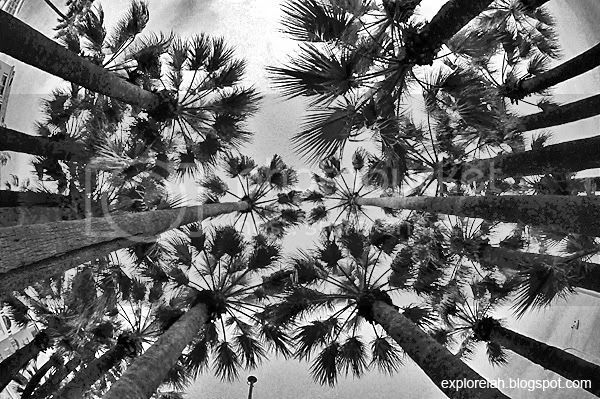 Tall palm trees surround and line the exotic city of Cannes where the municipal code of arms is a single stalk of leaf from the Phoenix Palm variety. That's the inspiration behind the Palme d'Or (Golden Palm) symbol of the Cannes Film Festival. We gathered at The Sphynx on Deck 5 at 8:30am before unboarding the ship to start the land tour. 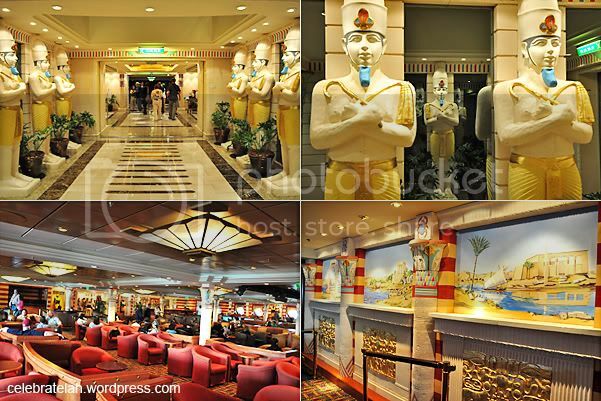 Interesting Egyptian themed decor with reliefs of pharaohs and hieroglyphs. 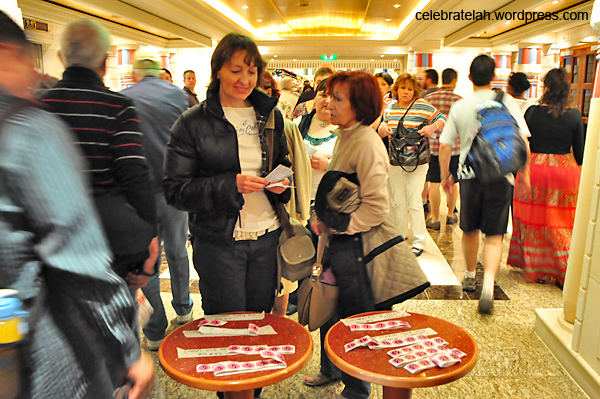 All guests who booked land tours were given stickers with numbers indicating their respective tour group. The groups leave on time so don't report late! A small boat ferried guests from the ship to the port of Cannes. The short ride takes about 15 minutes and best place to be is at the tail of the boat as we are leaving to get a good shot of the whole Liberty of the Seas ship. 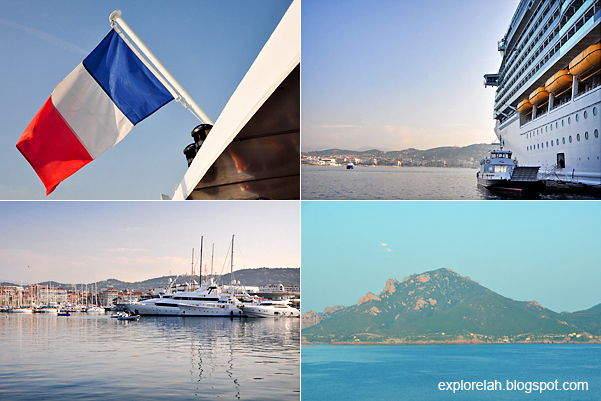 After getting that shot, move to the front of the ship to get shots of the Cannes coastline. 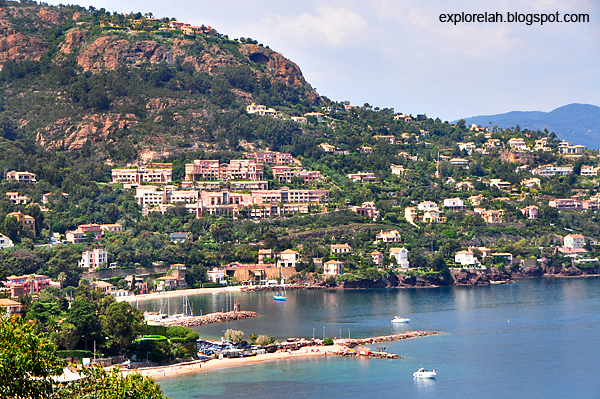 The seaside developments invoked a sense of grandeur as we approached Cannes. Immigration admin is not necessary so there's no need to bring along your passport. The SeaPass Card is all you require to get on and off the ship and into the various ports. The card is issued upon checking in for the cruise at Barcelona. It also acts as a charge card onboard the ship. Upon stepping out of the simple port, coaches were already waiting for us and we just needed to look for the bus that corresponds with our tour number. 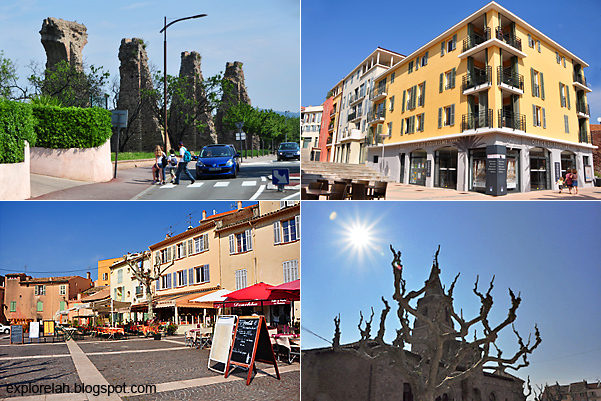 Our Scenic French Riveria tour started at 9:00am and ended at around 3:00pm (6 hours). 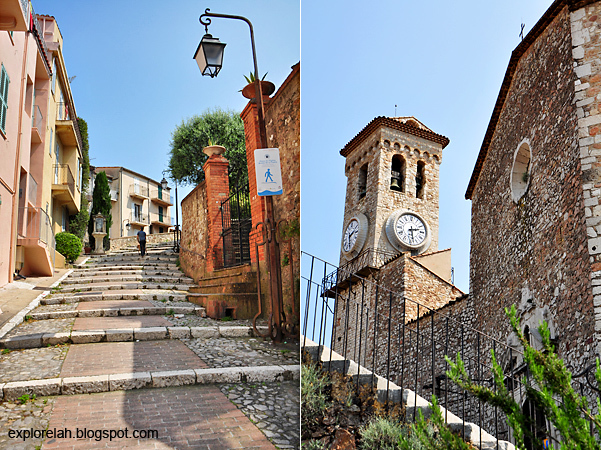 Our first stop for the tour was a visit to Ville de Fréjus, a somewhat medieval town an hour's drive from Cannes. So excited to be on the street of Cannes! The trees lining the roads are so neat and every once in a while, a wall mural pops up. 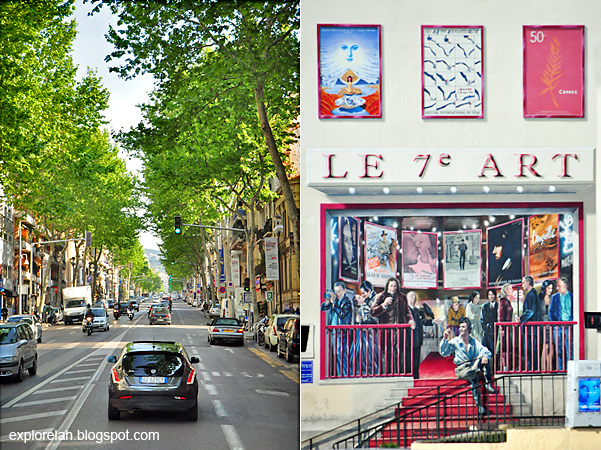 This mural at the side of The 7th Art Hotel is a painting that depicts a cinema entrance with posters and actors who won awards at the Cannes Film Festival before. Film is considered to be the 7th art. We were actually on the bus and quite far away but the great 3D effect was so stunning and attention grabbing that even my poor eyesight didn't miss it. 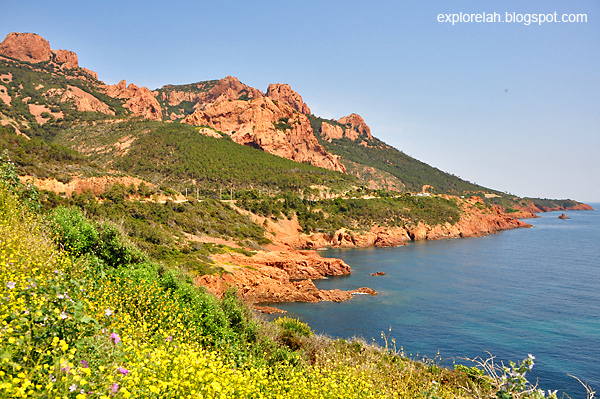 Along the way to Fréjus, we passed by some ancient ruins and monuments. 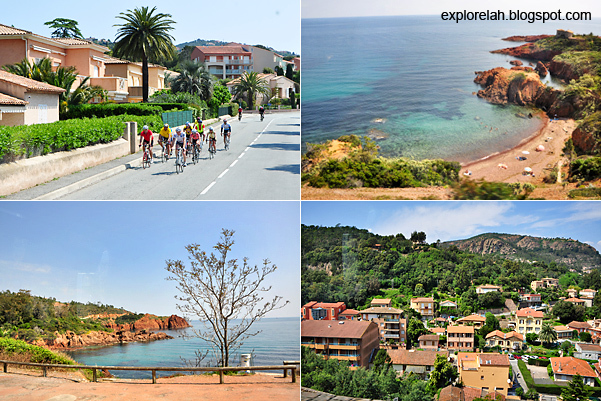 Fréjus is touted to be the first naval town in the Mediterranean. Top right pic : The grey section below the yellow block is where the town's tourist info centre is located. 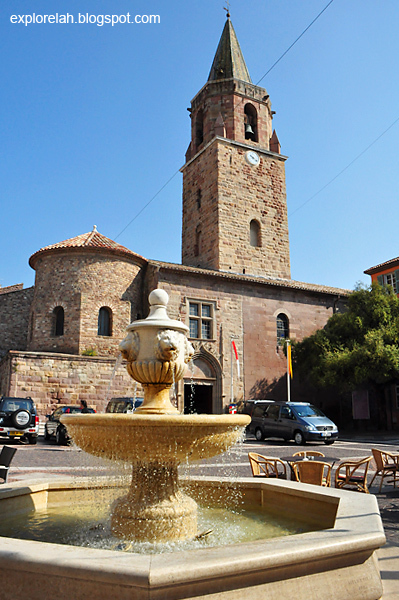 The 5th century Cathédrale Saint-Léonce de Fréjus is a gazetted national monument of France. Nave and pews of the baptistry. 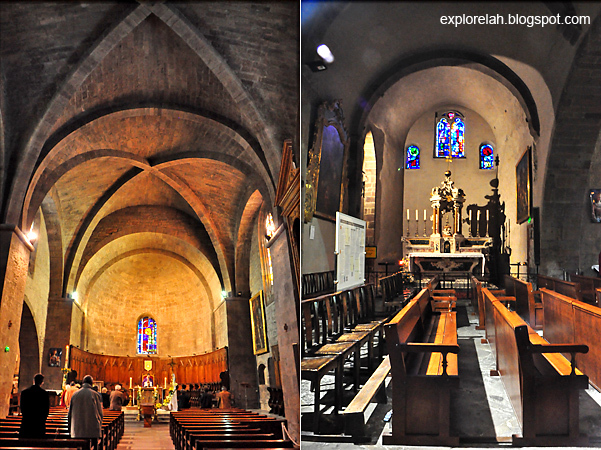 The Fréjus Cathedral is still in use and during my visit, a solemn funeral service was taking place. 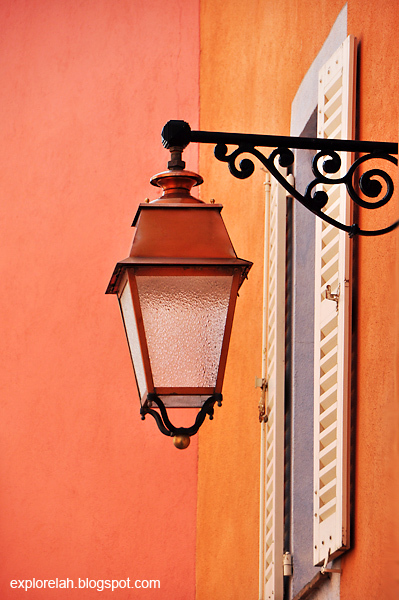 A classic French street lamp that is both functional and decorative extends from the brightly coloured walls of residential blocks within the town. The warm hues of the residential facades and their cursive wrought iron accents made getting lost in this labyrinth a beautiful affair. Enjoyed taking a peek into the lives of the townsfolk. My impression of the French is one of snooty arrogance, but the folks here showed me otherwise. They were friendly and welcoming! One side of the town houses the residences while the other side bustles with cafes, shops and street stalls. 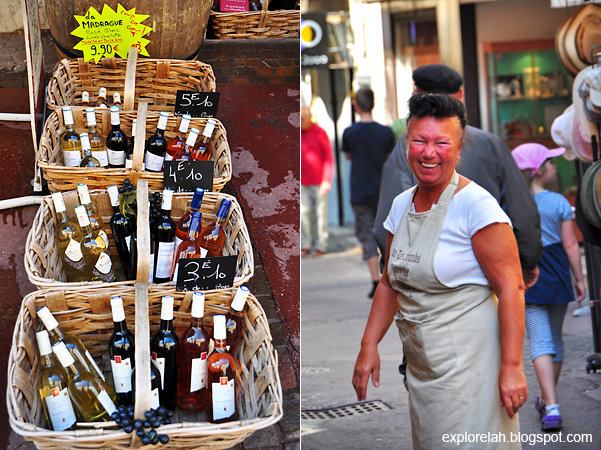 The wines are soooooo cheap! But any alcohol bought outside and brought onboard Liberty of the Seas will be held for safekeeping until the end of the cruise. You can only drink alcoholic beverages purchased from the ship. 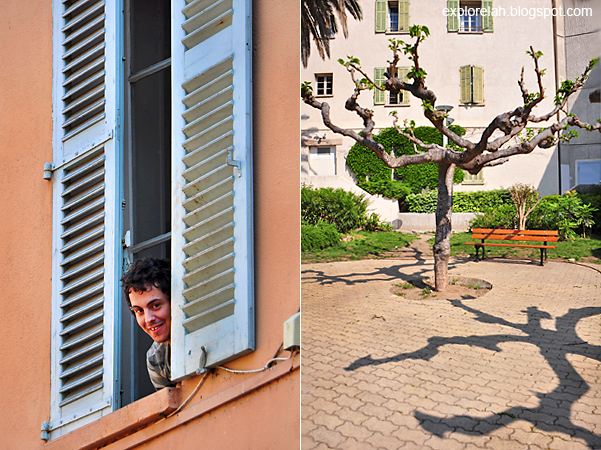 We were given an hour to self-explore Fréjus before driving back to the waterfront district of Cannes. 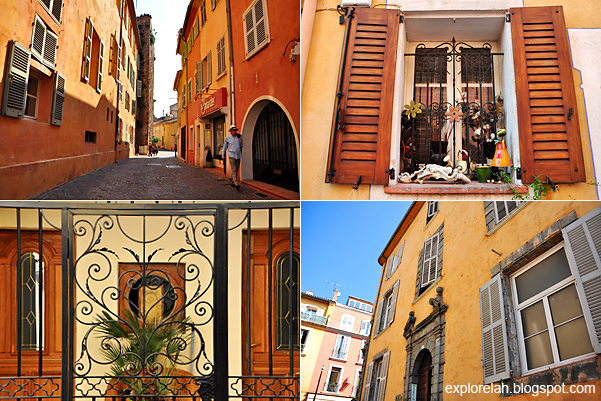 Fréjus actually has a lot more to offer and travellers could use it as a base to venture out to surrounding attractions. 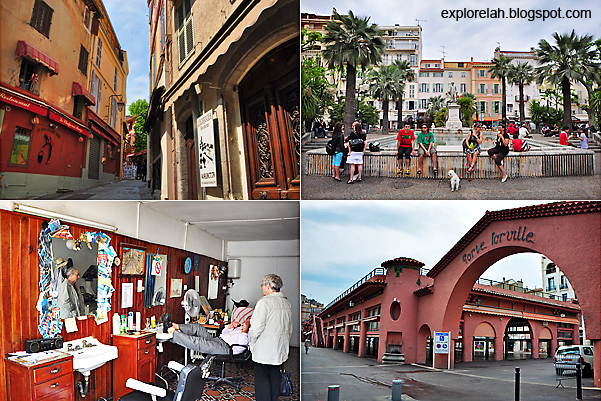 As a part of the Scenic French Riveria tour itinerary, Fréjus provided a nice introduction and feel of old France. 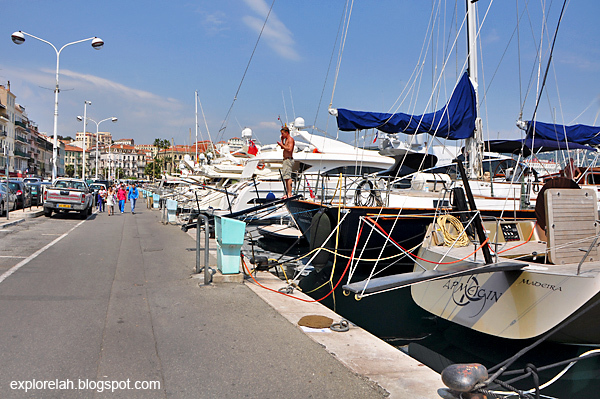 Back from Fréjus, we were dropped off along Promenade de la Croisette (the equivalent of Orchard Road, but by the sea) near the port and given about an hour to browse Cannes on our own. 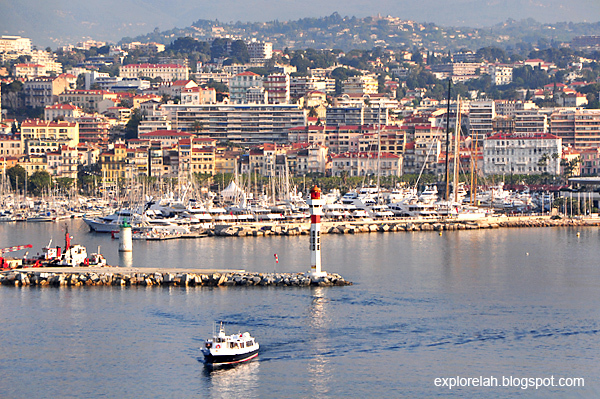 There's a choice of chilling out at a cafe by the marina, shopping or do a quick walkabout to take a touristy shot in front of the Palais des Festivals et des Congrès where the star-studded film festival is held. Well, you know me lah, very kiasu one, always want to see more to make my money's worth so my parents and I decided to checkout the sights. As we've passed by the film festival venue and it didn't raise any eyebrows, we decided to check out a church whose beautiful dome is very prominent in the city skyline. 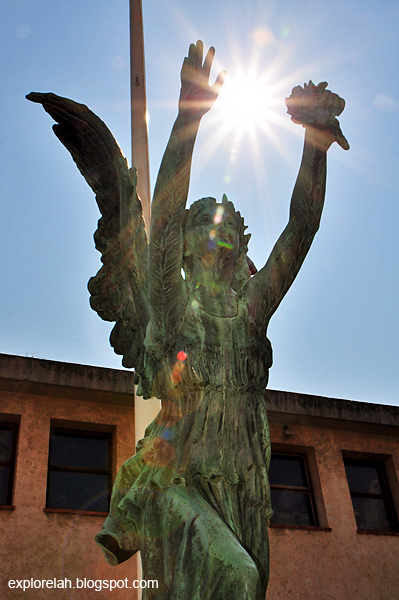 Statue of an angel opposite the church we wanted to visit. No idea what's the name of this church. I tried looking for it's name there but everything is in French so I decided to search online. It's strange that this church is so conspicuous but I couldn't find anything on Google about it! 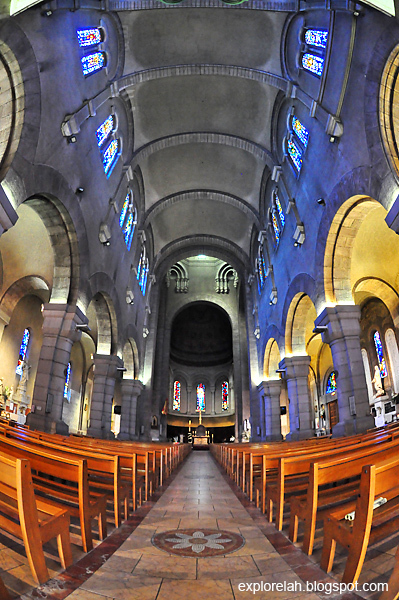 The interior of the cathedral is bathed in a purplish-blue aura by sunlight filtering through the stained glass windows dominated by that hue. 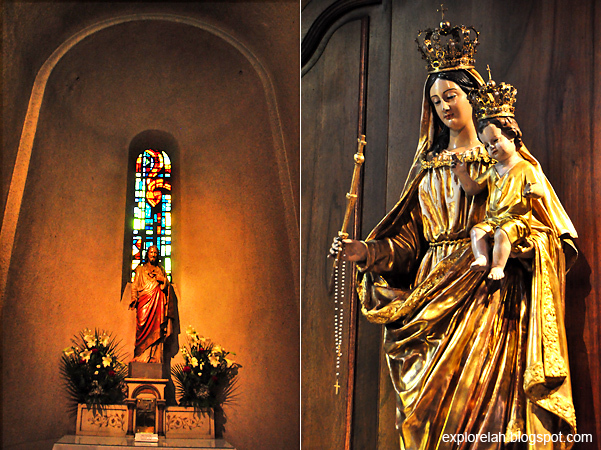 The church has some pretty vivid statues of Jesus and Madonna with the Saviour as a child. Maybe it's the violet cast, an unusual choice of interior colour for a church, that made the space feel rather contemporary. 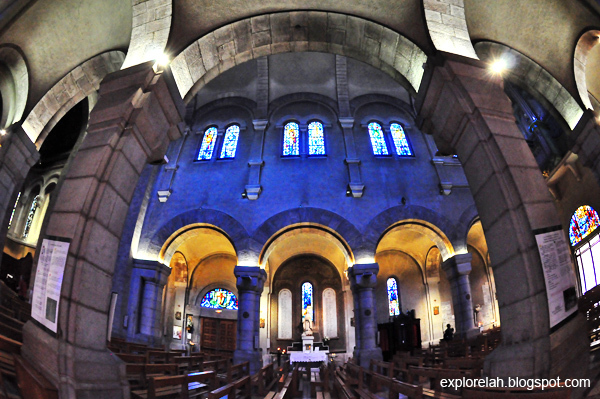 I thought it rather clever to create 3 layers of colours within the church. I interpret it as a sort of allusion to the Holy Trinity. We only managed to see this church during the free-and-easy hour because I sank quite a bit of time photographing this place. Thankfully it's not very far from our coach's drop-off point where we're supposed to board again for the next segment of our shore tour. In my opinion, this is the highlight of the tour. Cruising along the French Riveria coastline half-way up the hill, we passed by properties of celebrities and the homes of who's who in the entertainment circle. As you can imagine... a hillside villa facing the Mediterranean Sea... you better be made of money. Breathtaking views of coastal developments. 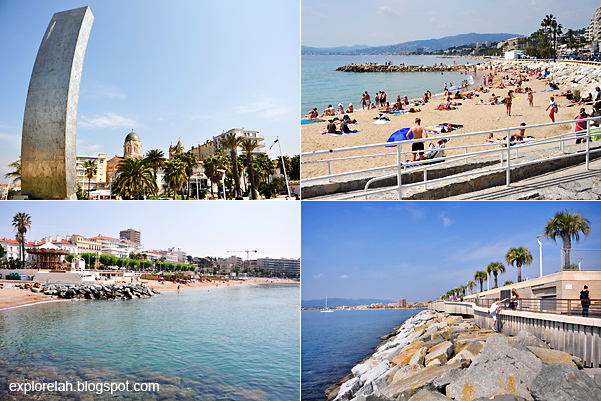 Cannes is truly a metropolitan city by the beach! The drive took about an hour with our guide giving a running commentary on the history and modern significance of districts and buildings. Apparently, there's an old car rally in Cannes where men and women would dress up like it is the 1940s. The women will bring along a dog, usually a poodle, and at the end of the rally, the best-dressed woman with the most beautiful dog will be given a trophy. So hoh mia (good life) right?! Stunning, stunning, stunning! Throughout the drive, oohs and wahs constantly escape the breath of everyone on the bus as scene after scene of dramatic cliffs diving into the pristine blue swept us away. For the best view, take the seats at the right aisle (when facing the front of the bus). I didn't put up a lot of photos here as the video at the end of this post will provide more footages and still images of this spectacular coastline. The drive lasted about an hour before we were alighted back at the port and the tour ended at around 3:00pm. Initally, I thought we can only leave and come back to Liberty on the Seas if we booked a shore tour when in fact, all guests can leave the ship and explore each port-of-call on their own if they want to. We just had to be mindful of the timing that the last connecting boat departs the port back to the ship. I was so delighted when I realised this and decided to extend my shore time. Told you I'm super kiasu one right? Mum and dad were rather tired so they headed back to the ship and I ventured the nearby area on my own before catching the last boat back at 5:30pm. Making the best out of my 2.5 hours in Cannes, I headed down the waterfront littered with countless private yachts without an itnerary in mind. I wandered around and let my eyes take me places. 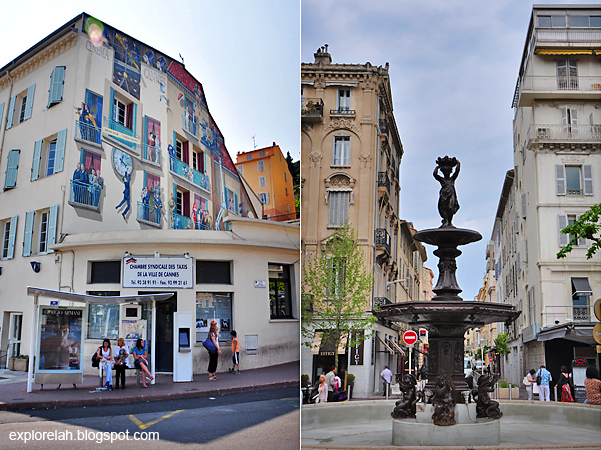 Another interesting 3D wall mural and streets flanked by classical French architecture. A peek at the buildings and lifestyle around downtown and surprised to find a retro barbershop. Bottom right pic : A local wet market that is one of the attractions in the area. But it was done for the day by the time I visited. Lunch was not provided during the shore excursion and I was famished but I didn't know what to eat as I did my solo walkabout. Prices at the restaurants I came across were rather high. 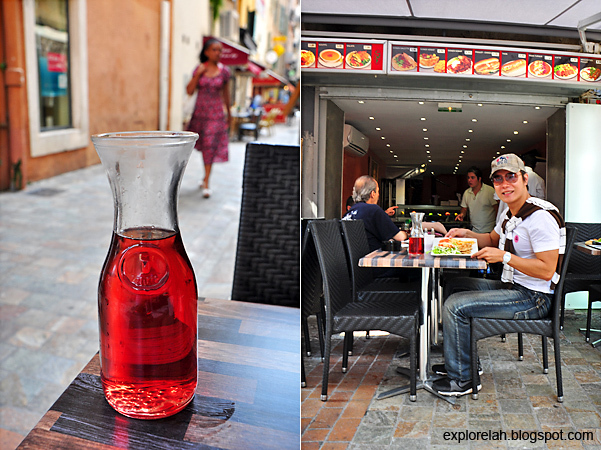 then I came across this Turkish sidewalk cafe and ordered a grilled chicken fillet and half a bottle of rosé. Food was so-so, the chicken pieces were very thin, but the wine made up for it! Feels great to just chill, get a little high and people watch. The meal cost €13.00. Time to horse around after a late lunch! 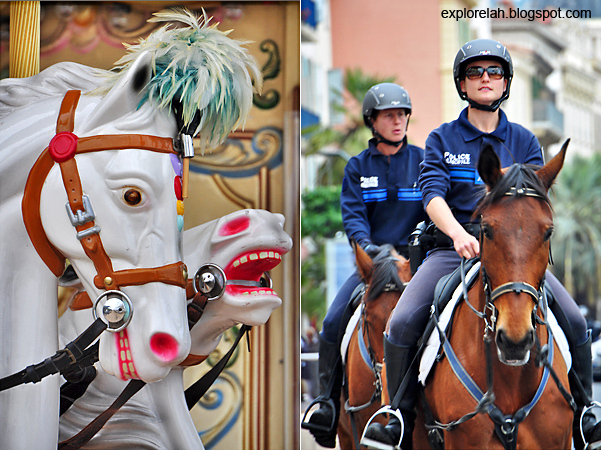 A carnival carousel sits near the beach while I'm surprised to see police on horsebacks prowling the streets. Look out for these white signs with a blue man on the streets. They are directional markers that indicate the way to an attraction under the self-guided City Walk initiative that Cannes has adopted. Following them, I negotiated the meandering cobble-stone pathways to reach the Notre Dame d'Esperance, a provencial Gothic-styled church built between the 14th to 15th century. I didn't enter the church as it seems like it has been turned into a museum that charges an entrance fee. 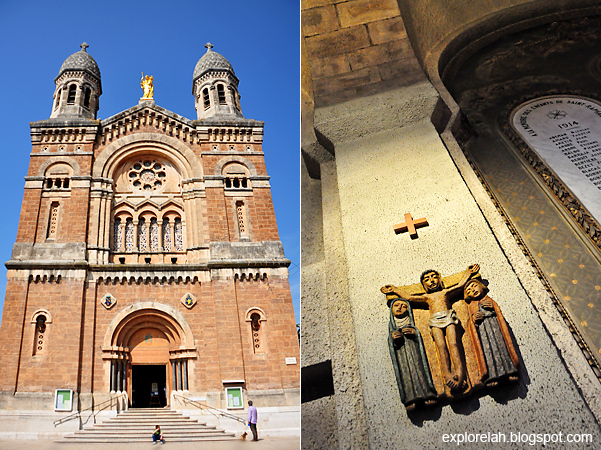 Notre Dame d'Esperance sits atop Le Suquet Hill and offered a vantage aerial view of the bay and Cannes. 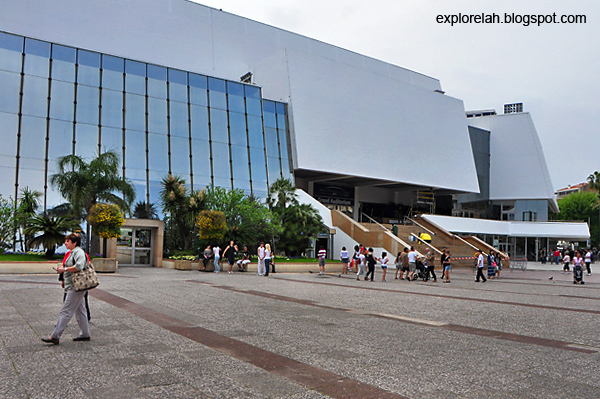 This is ground zero where the Le Festival International du Film de Cannes (Cannes Film Festival) is held in May every year. Let me indulge in its French name even though the English counterpart is shorter. It's not often that I get to travel so far and this is the first time I'm in Cannes! My "I've been to Cannes" shot. 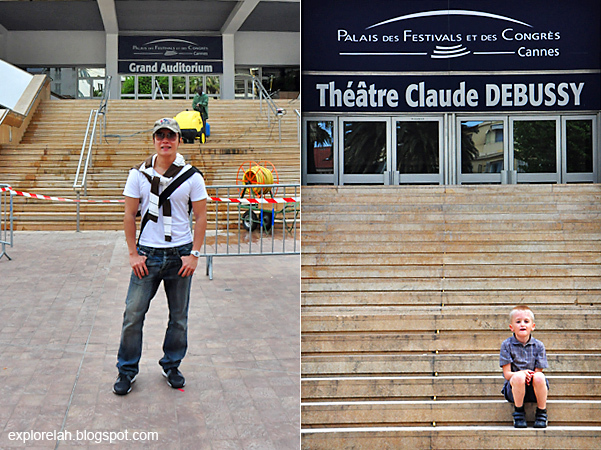 The stairs leading to the Palais des Festivals et des Congrès where the ceremony is held was undergoing rejuvenation for Cannes film fest 2011. I was there on 26 Apr 2011. The 2011 edition of the film fest was held from 11 -22 May. After my touristy must-have shot in front of the film fest venue, I walked along the docking area for private yachts again to head back to the port. 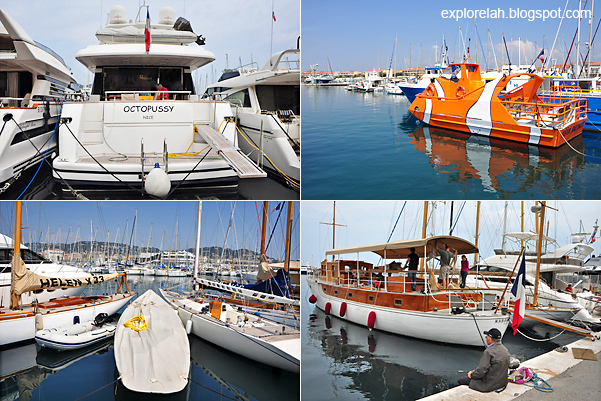 This time round, I took a closer look at the sail boats and discovered some rather interesting sights I missed out. Bottom right pic : The senior gentleman was fishing by the docking bay. With all the maritime activities, won't the fish be already frightened away? Weather during my visit could be said to be 4 seasons in one day. It was gloomy and dull when we first arrived, then hot and sunny, followed by a light shower before the sky got really grey and muted in colours. Whale sighting! LOL... I'm terrible. But I really love the expression of this boy enjoying himself and having a 'whale' of a good time! How can I come so close to the Mediterranean Sea and not have a feel of it right? Seeing how the French were swimming and frolicking in the waters, I decided to roll up my jeans and get in. It's friggin' cold!! But still, if I had a change of clothes, I would go for a swim just to top off the whole Cannes' experience!